NBC 6's Johnny Archer reports on the latest developments. Tension continues to build in Florida as the possibility of a recount continues to loom over key races: the Florida Governor's seat, the Florida Senate seat and the seat for agriculture commissioner. By noon on Saturday, all 67 election supervisors were to send unofficial electoral results to Secretary of State Ken Detzner. Detzner is then expected to review those results and decide whether any races are in need of an automatic recount. That decision will be made at 2 p.m.
An automatic machine recount is ordered if races are within .5%. A hand recount is ordered if the margins are within .25%. Lawyers for the candidates in Florida's close Senate race faced off in court Friday afternoon as the race appeared headed to a recount, along with the race for governor. Gov. Rick Scott, the Republican candidate for Senate, is alleging that elections officials in South Florida are trying to "steal" the election for Democrats, while President Donald Trump said officials were "finding votes out of nowhere." Both claims were made without evidence. Scott's campaign filed a lawsuit demanding that Broward Elections Supervisor Brenda Snipes turn over several records detailing the counting and collection of ballots cast for each day of the past week. A hearing on the case was held Friday afternoon, where Circuit Judge Carol-Lisa Phillips said there was a violation of Florida's Constitution and public records act. The judge ordered Snipes to allow inspection of the records on or before 7 p.m. Friday. The information sought includes ballots not yet reviewed by the Canvassing Board, absentee ballots and early voting ballots. Meanwhile, Democratic incumbent Sen. Bill Nelson has begun preparing for a potential recount in a race still too close to call against Scott, who is leaving the governor's seat because of term limits. Nelson's lawyer called that race a "jump ball," while Scott's campaign urged Nelson to concede. Scott held a 0.15 percentage lead over Nelson on Saturday afternoon. Nelson said Friday afternoon that Scott is impeding the democratic process and trying to stop all the votes for the Senate race from being counted. In the governor's race, Democrat Andrew Gillum's campaign said Thursday it's readying for a possible recount. The race has tightened since he conceded to Republican Ron DeSantis on Tuesday night. As of Saturday afternoon, DeSantis led Gillum by 0.41 percentage point. Florida is a perennial swing state, and many of its elections have been decided by the thinnest of margins since 2000, when Florida decided the presidency by 537 votes in a contest that took more than five weeks to sort out. Still, the state has never seen so many dead heats in one year. While the Florida Department of Law Enforcement said Friday there had been no allegations of fraud, Scott asked — but did not order — the agency to investigate the counties' elections departments for possible fraud. A spokeswoman for the agency said there was no active investigation. 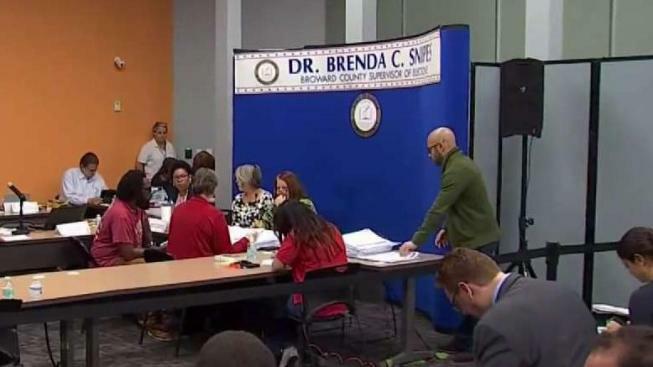 Broward County has been under the microscope as they have faced criticisms for delays in the tallying of ballots. Snipes said she didn't know how many ballots remain to be counted, but all were being processed. She also did not know how many provisional, military and mismarked ballots need to be counted. Her department's website said ballots cast on Election Day have been counted. Snipes appeared to blame the delays on the length of the ballot during a brief interview with NBC 6 Thursday evening. "I thought I answered, you know we have five or six pages," Snipes said. Broward officials said they would resume counting provisional ballots Friday afternoon. Before the count started, a group of protesters held a demonstration outside the elction office, waving signs and chanting "Brenda Snipes has got to go." The Palm Beach County Canvassing Board was also convening Friday for the opening and canvassing of vote by mail ballots and provisional ballots. Palm Beach supervisor of elections Susan Bucher said they were expected to finish Friday and were preparing for recounts. She also spoke out against criticism of the delays. "I just felt it's very unfortunate that some of the highest elected officials in our country are trying to disrupt our democracy because they don't like the demographics of our voters. I would wish that they would allow us to continue to count the ballots, we're just doing our jobs in accordance with law," Bucher said. In his press conference Thursday night Scott cited no evidence of wrongdoing, and the counties have until noon Saturday to report their unofficial vote count. FDLE Spokeswoman Gretl Plessinger said the law enforcement agency would follow up on Scott's request. But the agency did not announce an investigation. Nelson's campaign released a statement saying Scott's action appears to be politically motivated and borne of desperation. Meanwhile, President Donald Trump tweeted: "Law Enforcement is looking into another big corruption scandal having to do with Election Fraud in #Broward and Palm Beach. Florida voted for Rick Scott!" Trump also said it was possible the federal government could get involved in the Florida vote count. "All of the sudden they are finding votes out of nowhere," he said. "What's going on in Florida is a disgrace." Sarah Revell, a spokeswoman for the Florida Department of State, didn't know of any other recount in a governor or Senate race in state history. Gillum's campaign said it has hired attorney Barry Richard, who represented President George W. Bush in the 2000 recount, and is monitoring the situation. Gillum's campaign said his initial concession Tuesday night was based on "best information available about the number of outstanding ballots" at the time. "Since that time, it has become clear there are many more uncounted ballots than was originally reported," the campaign said. "We are committed to ensuring every single vote in Florida is counted." DeSantis declined to discuss prospects for a recount, telling reporters he's "very proud to be elected." "We're working really hard on the transition," he said. "We'll let the lawyers do what they gotta do, but we're good and I'm looking forward to serving." Meanwhile in Broward County, officials announced that there will be four local recounts. Mayor of Plantation, Pompano, West Park commission and Walnut Creek commissioners will all be recounted.